At our May 10th Board of Director’s meeting we added four more new members. We are approaching our second year in a row with nearly 30 new members! We are proud to announce and welcome new members Michael Freeman, Richard Misner, Steve Tellyer, and Peter Galeno from Fieldhouse Arena. During the past month At our April 26th meeting we also held our first new member induction ceremony of 2017 to initiate and welcome all new members that have joined since July 2016. At our May 24th meeting, Matthew Cioffi, club president, recognized Lion Ruth Calvagne. Ruth joined the Lions in 2009 and received the Melvin Jones Fellowship in 2015. Ruthie was honored for her endless days she spends, week-in and week-out at the thrift store, rolling with the changes, organizing and moving stuff again & again. She also our prolific Can Lady and honorary Tail Twister whenever we need her and for being generous to others in need in our community throughout the year! 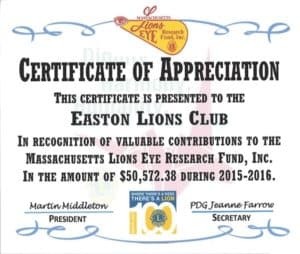 At the April 26th Meeting, the Past District Governor, Roland Grenier and Past President of the Massachusetts Lions Eye Research Foundation (MLERF), Martin Middleton presented the Easton Lions Club with their highest award for our work in fundraising for Eye Research during the 2015-2016 Year. 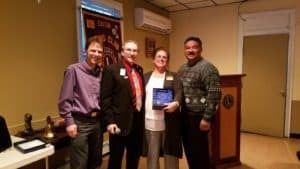 Nancy Sullivan, who was President of the Easton Lions during the 2015 – 2016, along with current President, Matthew Cioffi, received the Award on behalf of the Club. The Champions of Sight Award is given to the Lions Club with the Highest District per capita donation to MLERF. Our Club gave over $50,000.00 to MLERF during the 2015-2016 year. This is a record amount for any Club in the State. This accomplishment was advertised in the State Publication, “The Eye Catcher” as special recognition. At the May 10th Meeting, District Governor Beverly Dillon and Incoming District Governor Deb Martin visited our Club to recognize Immediate Past President Nancy Sullivan, and the Easton Lions, for our outstanding contributions as the Number 1 Club in District 33S, and Lions Multiple District (MD) 33 (all Lions Clubs in the State) in donations to the MLERF for the 2015-2016 Lions year with a total donation of $50,572.38. Our “Pennies for Sight” donations have as yet to be tallied into the total. With these donations, the Easton Lions have now totaled $459,277.62 in support of the Fund over the years. CONGRATULATIONS TO ALL EASTON LIONS for their being recognized and being shown such high-level appreciation through this award.